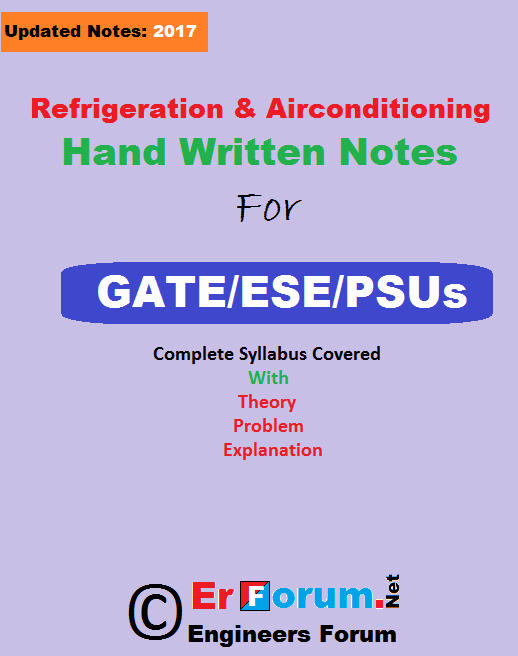 Download Latest Hand written Notes of RAC based on New Syllabus of GATE and Engineering Services. These notes are prepared under the Guidance of Best Mechanical Engineering Faculty of One of the Reputed Institute of New Delhi (INDIA). Neat and Clean Handwriting with well explained concepts. Refrigeration and air-conditioning: Vapour and gas refrigeration and heat pump cycles; properties of moist air, psychrometric chart, basic psychrometric processes. Buy this Notes For Rs 75 Rs 50 Only. Note: Use Discount Code GATE2017 to buy this note for Rs 50 only. You can buy this note using your wallet Money (Paytm, Freecharge, Mobikwik, OLaMoney, JioMoney). Vapour compression refrigeration, Refrigerants and Working cycles, Compressors, Condensers, Evaporators and Expansion devices, Other types of refrigeration systems like Vapour Absorption, Vapour jet, thermo electric and Vortex tube refrigeration. Psychometric properties and processes, Comfort chart, Comfort and industrial air conditioning, Load calculations and Heat pumps.